Hong Kong is too small a market to support the number of E-wallet and stored-value service providers that have been licensed in recent years. Some market consolidation or collaboration is likely in the sector, say industry insiders. They were taking part in a panel session during the Finovate Asia conference held at the Hong Kong Convention and Exhibition Centre. “We don’t have the markets for over a dozen stored-value facilities; E-wallets and payments instruments. I think there’s going to be a process of consolidation and differentiation,” said Michael Leung, chief information and operations officer at Hong Kong-based China CITIC Bank International. Mr Leung noted however that the announcement in September that the Hong Kong Monetary Authority was authorising so-called Faster Payment Services (FPS) open to conventional banks as well as to “stored value facilities” – the local regulator’s term for E-wallet providers – was a “very important thing for Hong Kong”. FPS has already been adopted in the United Kingdom, European Union and mainland China. By entering the mobile phone number or the email address of the recipient, funds can be made available to the recipient almost immediately, according to the Hong Kong regulator. 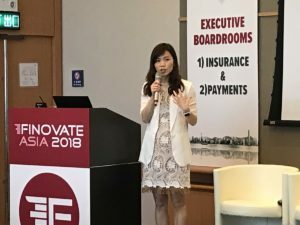 Mr Leung was speaking at the Finovate Asia session “Expert Debate: Payments innovation – Where is Asia ahead of the West and where is it lagging?” The session was part of Hong Kong FinTech Week 2018, presented by InvestHK, Hong Kong’s inward investment agency, and organised by Finovate. Speakers on the panel stressed some advantages of Asian regional markets for E-payment services – compared to mature economies in Europe and the United States. Many Asian consumers in jurisdictions with developing economies either don’t have a conventional bank account or bank credit or debit cards. Hong Kong was placed in the ‘developed’ basket in this context. Nonetheless, even for Hong Kong, panel members saw value of collaboration among the mosaic of single-jurisdiction service providers. The audience heard that Malaysia already had circa 30 E-wallet and stored value providers. Several speakers equally stressed the potential for cross-border collaboration as well as consolidation within national markets, and hoped that mobile payment globally and regionally could avoid the emergence of the kind of online monoliths that have been created in the social media sector. So far, thought the experts, it was not clear that the likes of China’s Alipay and WeChat Pay would dominate globally mobile payments in the manner of Facebook and Twitter in social media. Nonetheless panel member Mikko Perez, founder and CEO of Ayannah, a FinTech company based in the Philippines and targeting the growing middle class in emerging Southeast Asian economies, said “proxy wars” were being fought in his home market by China’s big two firms. “In the Philippines, Alipay has just invested in one of the telcos, Globe [Telecom] part of the Singtel [Singapore Telecommunications Ltd] alliance. So Alipay’s ‘trojan horse’ is GCash, and I think it is getting a bit of traction there,” stated Mr Perez. He was referring to an Alipay mobile wallet available via smartphone to users in the Philippines. “Tencent just invested along with private equity firm KKR in the rival network PayMaya,” he added, referring to Tencent Holdings Ltd, the developer of WeChat and the WeChat Pay system. 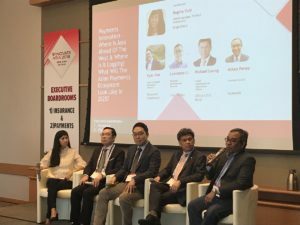 Ryan Kim, head of digital banking and alliance, at bank Standard Chartered Plc, observed during the panel session that in four markets where it had involvement in such business, “I haven’t seen any global player dominating the entire payment market”. While China CITIC Bank’s Mr Leung said his institution had “no intention” of developing its own wallet; Standard Chartered is on record as having applied for its own virtual banking licence in China. It is seeking collaboration there and working with partners in other markets. “In Taiwan we work with LINE, and in Korea we work with Samsung Pay and PAYCO. In China we work via a virtual bank licence, and we are looking to a number of the FinTech players [in order] to work together,” noted Mr Kim. “Cooperation is very important. Globalisation will be a future trend,” said Lawrence Li, business development director for TNG Wallet, a peer-to-peer payment online network of TNG (Asia) Ltd, a Hong Kong-based firm. Mr Li said his company was working on “constructing global E-wallet alliances”, via “something quite similar to SWIFT in the banking world”. That was a reference to the Society for Worldwide Interbank Financial Telecommunication, which enables financial institutions worldwide to send and receive secured information about financial transactions. The executive nonetheless anticipated that globally the cost of running E-wallet services was likely to rise as providers faced greater regulation, such as compliance with the European Union’s General Data Protection Regulation. In an earlier presentation at the same event, Venetia Lee of Alipay Hong Kong Ltd stressed the social utility of some of the Chinese group’s services. “From online to offline” payment – i.e., providing financial services to individuals and small firms not part of the conventional banking system – was “one of the big steps that we are very proud of,” she noted. “Even the name” of Alipay’s parent firm, Ant Financial Services Group “shows we are very focused on bringing equal opportunities to little guys… to serve the small and medium-sized merchants,” Ms Lee stated. She added: “Throughout China in the last couple of years, we have made a lot of effort in serving little merchants with QR-code-based ‘money collection code’ services, where you print out the code and display it in the shop,” for consumers to capture and link to via their smartphone QR code-reader. “It is very, very low cost, and easy to adopt and that is why it has spread quickly to a lot of mom and pop shops,” said Ms Lee, general manager and head of Alipay’s Hong Kong, Taiwan and Macau business.